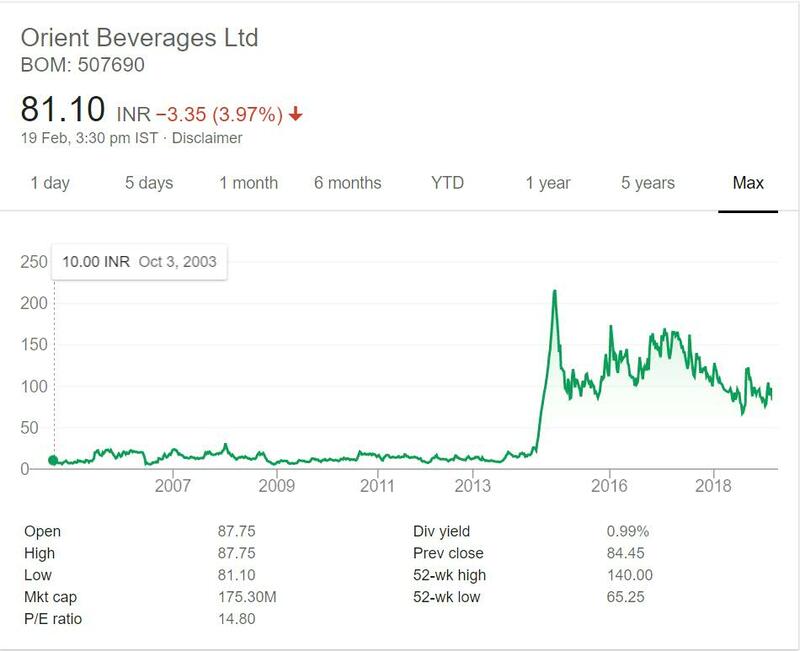 Orient Beverages Limited is in portfolio of Subramanian P. He is one of the top investors in India. The company belongs to Beverages sector . As per the Company website it is currently engaged in the business of packaged drinking water under the brand name Bisleri.The Company has set up its own manufacturing facilities at Domjur (Howrah) and Dankuni (Hooghly) in the state of West Bengal. The Company also operates in Reality sector. Note in past it was in Soft Drinks business which it sold to Coca Cola. The Soft drink brands were Limca, Thumbs Up, Citra and Bisleri Club Soda. The price chart is very interesting. There are two parts of the price chart. One from year 2002 to 2014 and other one from year 2014 till 2018. From year 2002 to 2014 (till early year) the stock was in range and there was not much movement. It was between 5 to 15 mark. From mid 2014 to end of the year the stock zoomed from 15 odd levels to above 200. In this journey it gave more than 10 times return to investors. It started to cool down after that frenzy run and settled near 80 mark. It gave 10 times return from 2002 level. At current market price it is giving 1% dividend as well. Orient Beverages Limited is in Beverages sector. Packaged drinking water is fast growing sector in India. The Company mainly operates in West Bengal and neighboring states. Many new players are coming on scene due to opportunities in this sector.It is fast becoming one of the most competitive space. Unorganized players are also gaining market share. There are local players also in competition. Rail Neer initiative is taken to grab Railways market share which is one of the major consumption area for packed drinking water. This is an interesting stock and can be monitored closely. The past experience in cold drinks area will help the Company. Due to recent jump it may look attractive but you should take care before making a decision.In case you are interested then you can track the company by adding it to your stock watch list. That way you can keep close eye on the Company.